Our phones, which is almost a misnomer these days as we tend to use our cell phones more as micro Laptops and less for talking to other people. As the smartphones become more and more powerful with greater operational capabilities, they have become an indispensable part of our lives for business and entertainment. For example, virtually everyone that owns a smartphone, utilizes the ability to send and receive emails and instant/direct messages (IM / DM). Often these messages contain attachments, including compressed files, such as the most common compressed file extensions being .ZIP, .SITX, .7Z, .RAR, and .GZ. If you’re an iPhone / iPad user, you know that those devices cannot natively open these types of compressed files without using a 3rd party App, which all have a cost associated with them. The unintended added bonus for the iXflash App is that it also offers a method to open and save / view files that are contained in a compressed file. Not only is the iXflash App completely free, but it can provide a very useful tool to open files that are currently unavailable through the iPhone and iPad’s native OS. On top of that, the iXflash App can hold and open/playback many formats of content, such as music and movie formats, like mp3, mp4, High Efficiency Video Coding H.265, flac, and many more. 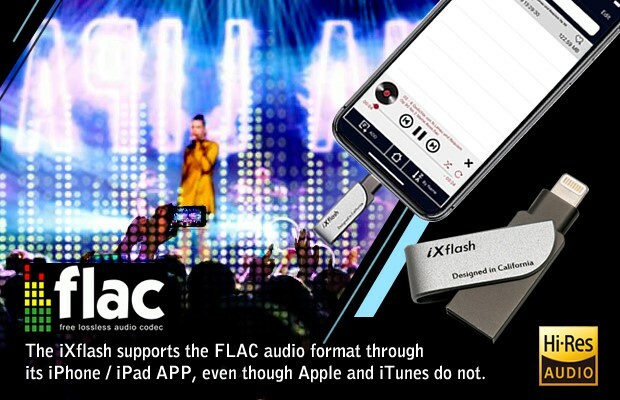 If you just want a temporary storage to place music and movies that’s easier to install and remove from your iPhone and iPad than iTunes, the free iXflash is your ticket. • Quick complete back-up of your entire photo album with just one touch. • Easily transfer files between PC/Mac computers and your iPhone, iPad, iPod. • Plus, many other convenient features that make the iXflash drive even more than just an extended flash storage for your iPhone, iPad, iPod. For more details about this topic or any product that Vinpower offers, please visit our website, www.vinpowerdigital.com or contact a Vinpower representative today. It was recently announced at the end of January that the once popular UltraViolet cloud movie locker will be shutting down for good in July. What does that mean for the more than 30 million users expecting content they paid for to be available to them on demand through this service, who collectively stored more than 300 million movies and TV shows in their cloud libraries? It puts them in a bind, even they are allowing customers to link their collection to another Digital Entertainment Content Ecosystem (DECE) service, it requires them to investigate which other cloud service they want to port their content over too and whether all their content will be available through the service they choose. Even though there are a number of other DECE providers, they all don’t have the access to the same licensed content. Therein lies a major problem, such as what if the alternative DECE service doesn’t have access to the same copyrights that UltraViolet does? That means a movie title you own through UltraViolet may not be offered on the service you switched to. What does that mean, do you lose that title? Even after you switch your library to another carrier, what if that company goes out of business too? Since everything is held in the cloud and you have no physical copies of your content, ultimately, there’s a risk you could lose your entire library of movies. That’s why it’s important to always maintain a physical copy of any digital content you own. Optical discs stored properly, have an extremely long shelf life and are not susceptible to the potential pitfalls that cloud based digital content is, such as data corruption or deletion. In fact, to prove the vulnerability of relying solely on Cloud storage, just recently, the once popular MySpace social media site confirmed that they irretrievably lost all data content from years 2003 through 2012. This data loss wasn’t because of the company being hacked or a virus, but simply due to an accidental deletion during a data migration from one set of servers to another. That would never happen with optical discs. If you want to make sure your movie collection or any digital content will always be available to you, keep a backup on optical discs! 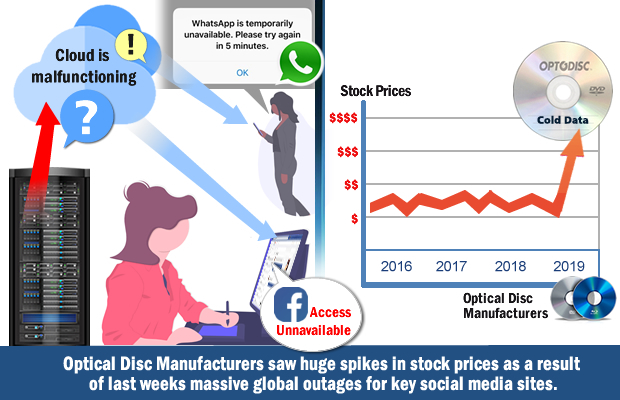 Optical Disc Manufacturers saw huge spikes in stock prices as a result of last weeks massive global outages for key social media sites. Last week, there was an unexplained outage for major social media outlets, such as Facebook, Instagram, WhatsApp, and others, due to what was called a ‘server configuration change’. Whatever the root cause was, the fact remains that millions of users from those sites were locked out and could not access their personal information, including pictures, videos, and other personal details. This sent a shockwave of concern about the safety of content on servers and caused a rush of investors to purchase shares in companies that focus on the manufacture of optical discs. Why would problems with cloud-based networks and the servers that support them cause a rise in the demand for an older technology like optical discs? The reason is simple, cold storage! Cold storage is taking content offline and storing it on a safe back-up solution which can easily be accessed to restore any lost data quickly. The best and most secure method of cold storage are optical discs. That’s because optical discs are laser inscribed (burned) data into a physical write once disc, that once written to is impervious to having its content deleted, altered, or disrupted through cyber-attacks. Plus, optical discs can retain data for many many years, some archival versions promise up to 1,000 years. That means that not only are optical discs impervious to being disrupted from outside forces, but they will also hold that data securely for a long time without using any electricity or other power source, making them more cost efficient as well. Since optical discs are still used for digital storage, all content on the discs can be located and uploaded quickly and easily. Once the public saw the potential pitfalls in the servers supporting the gigantic cloud-based networks, which I have been touting for years, they realized there needs to be a more secure back up solution. This prompted investors to purchase stocks of companies producing just such a product in record numbers. That’s why Vinpower continues to not only continue focusing on optical discs, but also work diligently to make improvements and ensure that our Optodisc line offers the best quality, most reliable, and cost effective discs on the market. For more details about this topic or any product that Vinpower offers, please visit our website,www.vinpowerdigital.com or contact a Vinpower representative today. 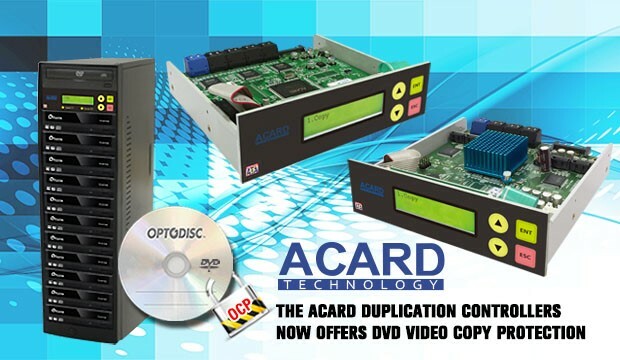 To match Vinpower’s existing proprietary duplication controllers, all new optical disc ACARD duplication controllers will offer the ability to add copy protection to all DVD video content. Vinpower has developed one of the most secure and cost-effective methods to implement DVD copy protection, which is available on their full range of optical disc duplication hardware, which now includes the ACARD controller. The copy protection application is embedded directly into all duplicated DVD video content, which includes protection from unauthorized copying or ripping the content from those discs. 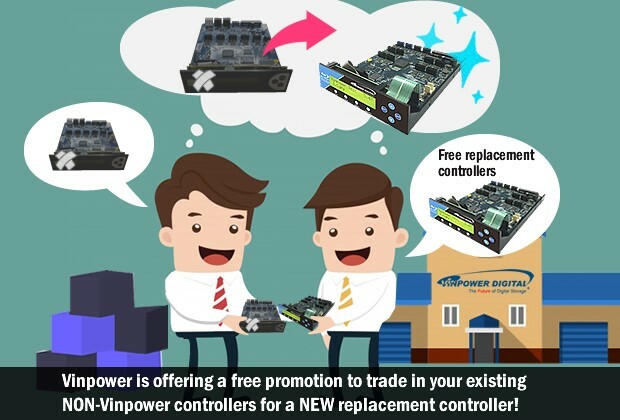 This is another value add that Vinpower can bring when it comes to its own controller or the recently acquired ACARD duplication controllers. The prior ACARD controllers were not able to provide copy protection. The new ACARD copy protection feature is extremely easy to produce and costs a fraction of what it would cost to use other methods of copy protection. In addition, the resulting protected discs have excellent playback compatibility, ensuring that you can play your protected content across all known optical disc players and player software that accept DVD±R media. This is a key functionality, as what’s the point of adding protection if the user can’t play the content on their preferred player or software. For more details about this feature or any product that Vinpower offers, please visit our website, www.vinpowerdigital.com or contact a Vinpower representative today. It’s a common occurrence nowadays when someone has contracted a virus on their computer or it was infected by malware, perhaps you’ve even personally been affected. These infestations can range from the mundane to totally catastrophic. Most often these harmful programs infect our computers through phishing emails or clicking on the wrong websites. People can often protect themselves by being aware and diligent as to what links they click on or through antivirus software. Though there is another threat that many people don’t pay close attention to, the potential risk of sharing USB flash drives. If someone using a USB flash drive has viruses or malware on their computer, they can inadvertently transfer those pests from their computer to that USB flash drive. Those viruses will lay dormant where they will wait to pounce on an unsuspecting victim who also plugs what they think to be an innocuous USB flash drive into their computer. Similar to sharing a hat with a person who has head lice, as the lice crawls from the hat of the afflicted person onto the unsuspecting victim who puts the hat on, the computer viruses will transfer onto the unsuspecting computer, infecting it and any other computers that USB drive is plugged in and opened. Vinpower has a way to prevent the spread of viruses and malware from computer to computer through USB flash drives. Using our USBShark or USBDupeBox USB duplicators along with write protect capable USB drives from Vinpower, the user can add write protection to every USB copy they make. In doing so, the write protected USB flash drives are impervious to anything infecting it or those infections passing from one device to another. The key is, once you convert the USB flash drive to a write protected / read only drive, the USB flash drive will not allow any new data to enter or transfer to another device, preventing any potential viruses or malware from infecting the USB flash drive. 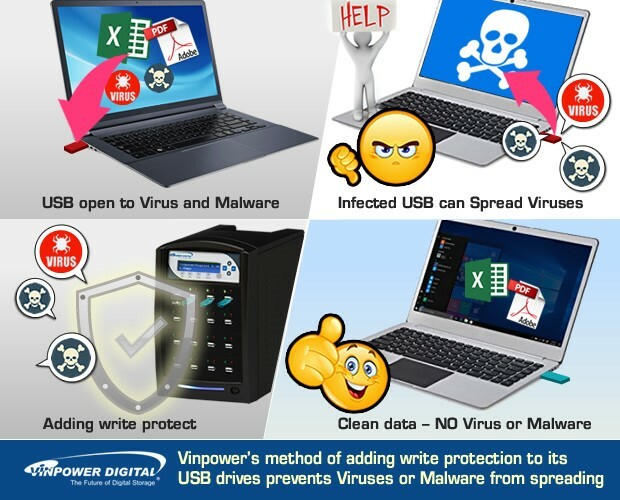 If your company needs to create content onto USB flash drives for your employees, customers, or for any reason, you can rest assured that those drives will not spread harmful viruses by using Vinpower’s Write Protection / Read Only feature. Then when you want to allow user(s) to be able to alter and/or add new content on the USB flash drive(s), simply place the protected drive(s) into the Vinpower USB duplicator and turn off the write protect / read only feature. Within seconds the drive is back to its original state. Don’t take any chances with your infrastructure, make sure you take as many precautions as you can to combat the rampant expansion of viruses and malware constantly attacking our personal and work-related computer content. 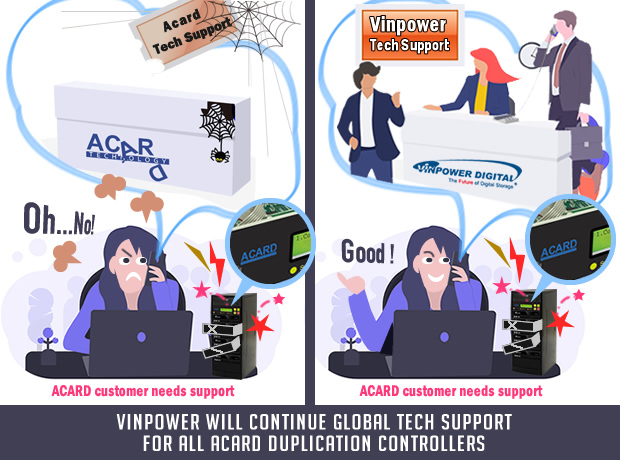 With Vinpower’s acquisition of ACARD’s duplication product line, it allows Vinpower to continue to offer ACARD authentic line of optical disc and hard drive controllers. 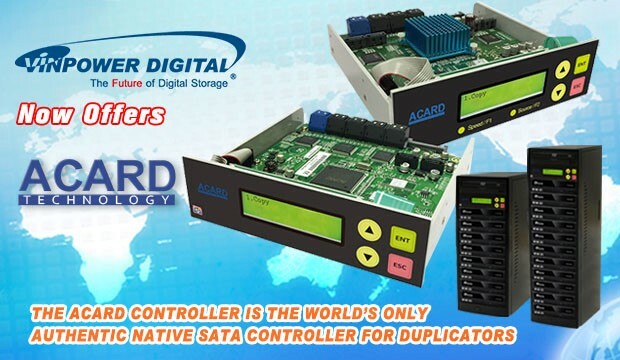 The benefit of this is that ACARD was the 1st and only duplication controller manufacturer to offer true Native SATA controllers. The benefit of the native SATA is that it provides the best solution in terms of compatibility with SATA components. Since all other controllers require a bridge adaptor to interface with a SATA connected device, this adds another component into the mix. Adding the bridge board increases the number of devices needed to interface with the SATA device as well as the overall cost. By using the ACARD native SATA controllers, it provides a true SATA to SATA connection and reduces the overall cost of the controller hardware, making the ACARD controller an attractive offering, especially in emerging markets where costs are a bigger concern. So if you’ve used ACARD in the past or you’re looking for an alternative to your current controller option, Vinpower can supply you with an authentic ACARD controller with true Native SATA interface.